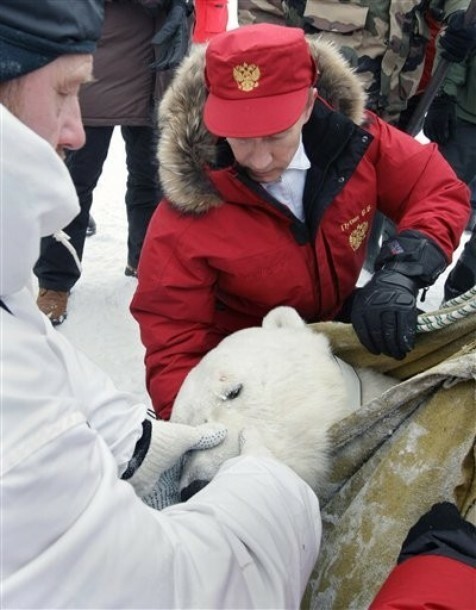 During a recent meeting with members of the Russian Antarctic Expedition, Prime Minister Vladimir Putin said that before Russia takes climate commitments related to the future of its industry and economy as a whole, it is necessary to achieve common understanding, common approaches, and common principles. Meanwhile, in Climate Change Performance Index 2012, Russia has lost seven positions, finishing 55th out of 61. “Not only did we sign but also ratified the Kyoto Protocol. However, activities of many industrialized countries result in a very significant impact, the most significant are those of the United States, China and India.” –Prime Minister Vladimir Putin said. – “And the U.S., China, and India – all they have their own opinions. Therefore, before the Russian Federation takes certain commitments related to the future of its industry and economy as a whole, it is necessary to achieve common understanding and common approaches, general principles by which mankind will be guided in making decisions. If separate countries make decisions on reductions, but the major issuers will be out of this process, there will be no result yet” (http://premier.gov.ru/events/news/18720/). The Prime Minister made this statement about the climate at the event on Antarctica. Recently the world's poles have become objects of lively attention of the world's major powers. It is not by chance - the North Pole alone harbors a quarter of the world's oil and gas reserves. Last year, the Member States of the Arctic Council signed the Nuuk Declaration: they agreed on coordinated response system in case of emergencies and co-operation in combating marine oil spills in the Arctic. Understanding the importance of the issues of northern territories is certainly a positive development. Ambitious plans to develop polar areas are fraught with serious problems for these highly vulnerable areas. However, in the absence of real state plans and Russia's commitments as a participant in the international climate process, these declarations do not leave hope that "the zeal of the poles" is the act of environmental responsibility. Rather, it is the desire to "stake out" a rich resource piece. Meanwhile, according to the Climate Change Performance Index 2012, over the past year Russia has lost seven positions, finishing 55th out of 61. The Index calculated by the Germanwatch analytical group takes into account 13 indicators of the three major groups - the current levels of greenhouse gases, their present and projected dynamics, and effectiveness of internal climate policy. Rating is calculated for the countries which account for at least 1% of global emissions, as well as leading countries in their regions. In the 2012 Index version, 61 countries are represented. No country takes the first three places, because "unfortunately, no country has done enough to prevent dangerous climate change." The fourth, fifth and sixth place was taken by Sweden, the UK and Germany. Outsiders were Kazakhstan, Iran and Saudi Arabia. Russia won the 55th place, next to her - Canada (54) and Poland (56), the U.S. (52), and China (57). Ukraine and Belarus got positions 27 and 39, respectively. Presently, Russia has no clear commitments, and this fact reduces incentives for implementation of any kind environmentally oriented measures. Speeches of the future president of Russia confirmed that environmental issues have not become important in Russia’s economic policy. According to assessments of the Russian Socio-Ecological Union, reductions of greenhouse gas emissions could be at least 40% by 2020 as compared to 1990 levels.